The Main Street site of the former Daybreal Nursery, where a cluster housing project has been proposed under a text amendment being scrutinized by the Planning and Zoning Commission. WESTPORT — What Westport’s housing stock might resemble in the future prompted the Planning and Zoning Commission on Thursday to delay its decision on a proposed text amendment that would allow a cluster housing development at the site of the former Daybreak Nursery. 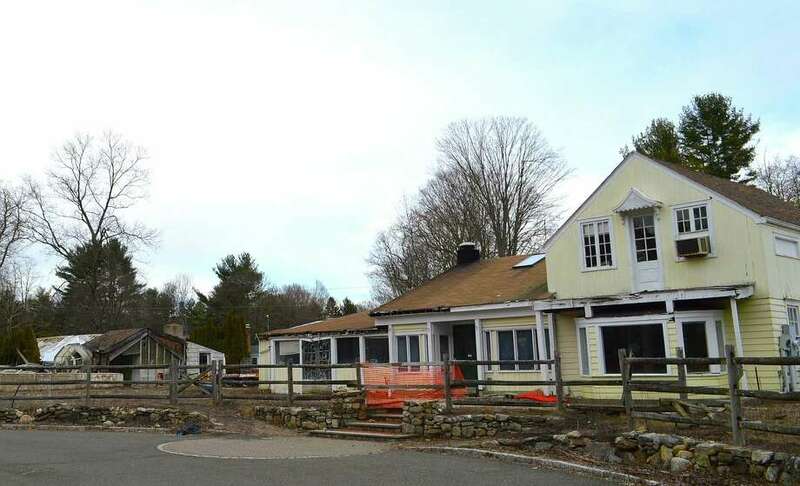 While a text amendment is not supposed to be site specific, Mel Barr, the land-use consultant who proposed it, has made it clear the proposal applies to a plan to build four houses on the 1.5-acre parcel at 500 Main St., just west of the corner of Easton and Weston roads, near Exit 42 on the Merritt Parkway — the only site in town that would currently qualify as the amendment is now worded. Barr made revisions to the amendment based on commission feedback at its last meeting, including changing the size of the houses from 3,200 square feet each to an average of 2,800 square feet. “It reduces the overall unit size and it has a little more flexibility from a design standpoint,” he said. Barr said, however, the “fallback alternative” for the applicant, should P&Z reject the cluster housing amendment, would be to file plans to construct four 6,000-square-foot, six-bedroom houses on the property. He said recently built homes average 5,700 square feet on half-acre parcels and 3,400 square feet on quarter-acre lots. Barr said the applicant “struggled” with the idea of making one of the units affordable, but was unable to meet the guidelines set forth by the state affordable housing law. He said the project would need to be “a little bigger project to make the affordable units work,” both from a design and profit standpoint. While a memo from Town Attorney Ira Bloom said he didn’t believe the cluster housing amendment qualified as spot zoning, commissioners were still uneasy with its relation to a specific project. “I think it’s kind of ludicrous that this hasn’t been identified as a single property,” said P&Z Chairman Chip Stephens, noting that Bloom had not attended the commission’s discussions on the proposal. “I am in favor of the idea of putting together a text amendment that allows people to move forward with cluster housing,” said Commissioner Paul Lebowitz, but he and others indicated that Barr’s proposal might not be the one. Stephens advised Mary Young, deputy director of the Planning and Zoning Department, to write a resolution for the panel’s next meeting. Stephens said his most “emotional point” during the deliberations had been a realization that for a long time developers have been tearing down smaller houses to build “McMansions” in Westport, and now the P&Z was being asked to allow denser construction of smaller units in a Residential A zone. Commissioner Alan Hodge said there are two factors to be considered when adopting a text amendment — the first being an examination of the benefit to the town, and the second, whether the text itself accurately speaks to that benefit. “There is certainly a market for this, and a good market,” Lebowitz said of clustered housing. Several members of the public spoke in support of the proposal, including several realty professional. “I believe it will give opportunities for people to downsize,” said Gerald Romano, a longtime town resident. P&Z Vice Chairman David Lessing said he felt the commission was giving contradictory feedback to the applicant, as members both expressed concerns about increased traffic at that busy corner while also indicating it wanted more, smaller units to be built. He also said the panel appeared to feel the cluster housing amendment should include some component of affordable and/or senior housing. “We need to be proactive about this,” Hodge said. “We don’t want developers to be in control of where affordable housing is put,” calling the issue important. “It’s only an important conversation if we, as a commission, express a vision,” Lessing said.